Bolognese Pasta in Vodka Sauce with Sausage - What's In The Pan? And as a bonus won’t have to travel to Italy to enjoy a really good Pasta in Vodka Sauce. 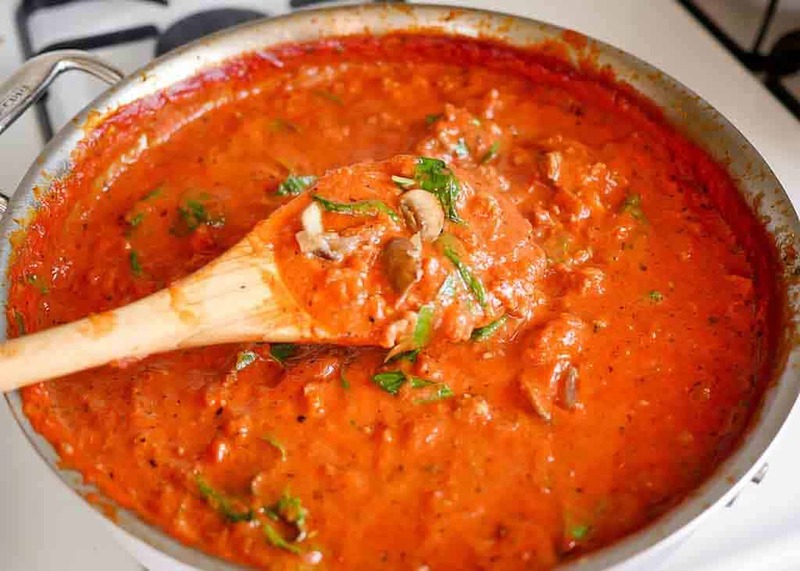 Because if you are reading this, you can EASILY make a great Vodka Sauce in your own kitchen. 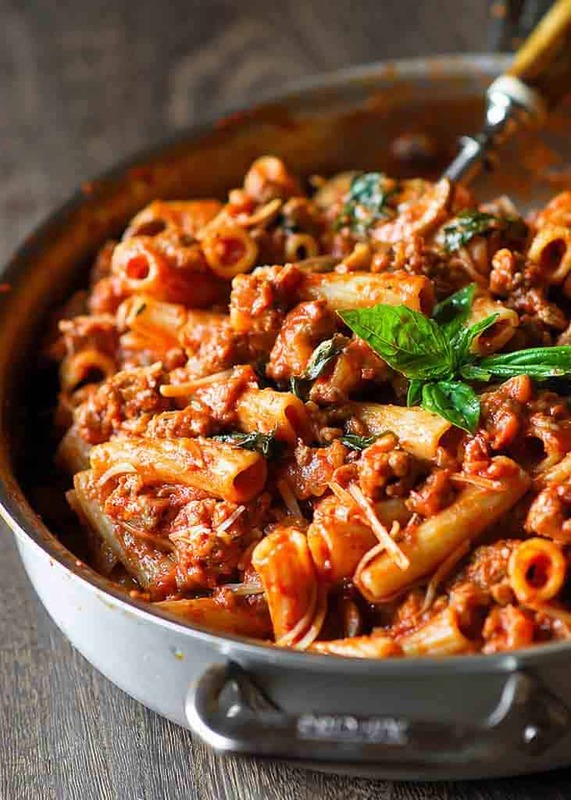 In my search for how to make this vodka sauce a la Bolognese, I discovered that there is no single recipe of Bolognese Sauce, but the basic ingredients include meat, tomato sauce and pasta. I used sausage as the meat and made from scratch creamy vodka sauce as the sauce. What pasta works best in vodka sauce? 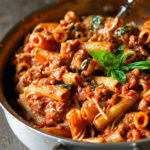 I also chose Rigatoni for pasta here (it’s tube-shaped and larger than penne – perfect for the thick meat sauce!) and added mushrooms and fresh basil. The taste is quite meaty and creamy, but at the same time very delicate and aromatic! You will enjoy it. And besides, I think you will appreciate all the layering of flavors (vodka, cream, garlic and Italian spices), the simplicity of ingredients (mushrooms, sausage and pasta), and the amazing smell in the kitchen! 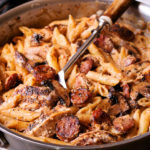 Nothing in this Pasta in Vodka Sauce with Sausage dish tastes overbearing or under seasoned. This is a fantastic and incredibly tasty bolognese meat sauce to go with your pasta. I promise, you will love this Pasta in Vodka Sauce, spiced up with all that vodka flavor. It’s elegant, easy to make and fills your house with incredible aromas. 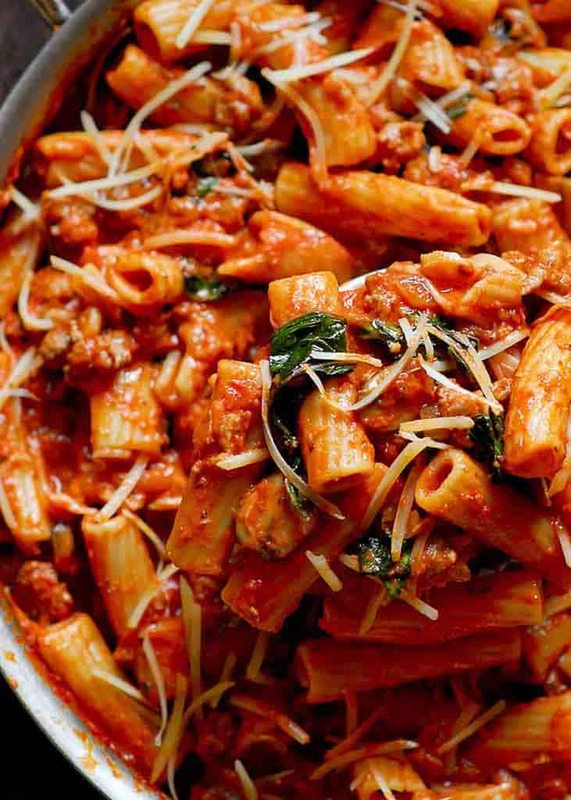 Let me tell you – sausage rigatoni here taste amazing. After making the Bolognese vodka sauce from scratch, I still cannot believe how easy it is to make home-made vodka pasta sauce, and how much superior in taste it is to the one bought in store. I will never go back to a jarred sauce ever again! And don’t be concerned about the taste of vodka. You can’t taste the harshness of the vodka, it is simply there to enhance the flavors, just like the wine does. My father hoped to taste vodka in this recipe after I told him that it contained it, but in vain. His main comment after finishing the dish was: “It has a nice spice to it, but why can’t I taste vodka in this? Did you put it in?” Vodka here just adds a touch of heat to help balance out the sweetness of the tomatoes and the cream. 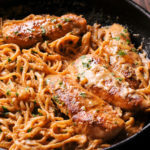 I highly recommend to use sea or kosher salt in this creamy vodka sauce as it lends a more refined taste than regular table salt, has no additives and is saltier. And do not rinse your pasta before adding it to your sauce. Pasta water is starchy, which helps the sauce cling to the noodle. Once meat and mushrooms are cooked, reduce heat (or even remove pan from heat) and add ½ cup vodka to the pan, in a steady stream, VERY SLOWLY. 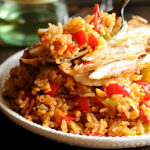 Increase heat to medium high to reduce vodka by cooking for 2 or 3 minutes. Add 1 cup chicken broth and 1 can (32 oz) tomatoes. Bring sauce to a bubble and reduce heat to simmer. Stir cream into sauce and simmer on low heat. When the sauce cooks with sausage, mushrooms, garlic, onions and tomatoes and of course, vodka, in it (see details in the recipe box), it will look like A LOT OF SAUCE! But wait, once you add pasta – you will think you didn’t have enough. To finish sauce preparation, cream and basil is added to the mixture at the very end, right before mixing it with pasta. 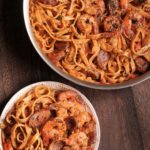 With this Pasta in Vodka Sauce with Sausage recipe, you can skip the restaurant and make the best vodka sauce at home! This amazing creamy pasta Bolognese dish will you feel like you are in pasta heaven! Heat a large skillet over moderate heat. Add 2 tablespoons of olive oil, 2 tablespoons butter, 4 cloves of minced garlic, and 1 chopped onion. Gently saute onions and garlic for 3 to 5 minutes to develop their sweetness. Add 10 oz of sliced mushrooms, cook for 2-3 minutes until mushrooms release their moisture. Add 1.5 pound of pork sausage, breaking it down with a fork. Cook sausage for 3 minutes, until it’s broken down in nice little chunks. It doesn’t have to be cooked through. Add 1 teaspoon salt and 1 teaspoon Italian seasoning and mix well into the skillet. VODKA SAUCE: Reduce heat (or even remove pan from heat) and add ½ cup vodka to the pan, in a steady stream, VERY SLOWLY. Increase heat to medium high to reduce vodka by cooking for 2 or 3 minutes. Add 1 cup chicken broth and 1 can (32 oz) tomatoes. Bring sauce to a bubble and reduce heat to simmer. Stir cream into sauce and simmer on low heat, while pasta is cooking (next step). PASTA: While sauce simmers, cook pasta in salted boiling water until cooked to al dente. Now back to the skillet with sauce. Add about 20 fresh basil leaves and cook for an additional minute, then remove skillet from heat. Drain pasta. Toss hot pasta with sauce. Taste and add more seasoning, if necessary. Serve in bowls with a few leaves of basil sprinkled on top and more freshly grated Parmesan, to taste. Basil and vodka is what gives it that extra flavor! Will definitely be making again and again. Thank you! I added 2 different sausages: sweet one and spicy one. So good! Also go slowly with vodka – don’t put it all at once. I followed recipe to the tee and it was absolutely delicious! I love homemade vodka sauce! Definitely add the fresh Basil and lots of basil! I liked the addition of mushrooms here. Made for a nice texture in the sauce. Will probably add bell peppers next time. I added double the basil because it just makes the sauce that much better. Loved it! I made this without any changes and it was exceptional!! The family loved it and it didn’t take a lot of time nor was it complicated. Made it for my date and I and she and I both got seconds and still had enough to take some for lunch. I highly recommend this recipe. This sauce is outstanding! One of the best sauces I have ever made. The family loved it and it didn’t take a lot of time nor was it complicated.